Personalized hunter & white 42” arc windproof vented auto-open umbrellas are the most gifted item during festive seasons and other marketing events. 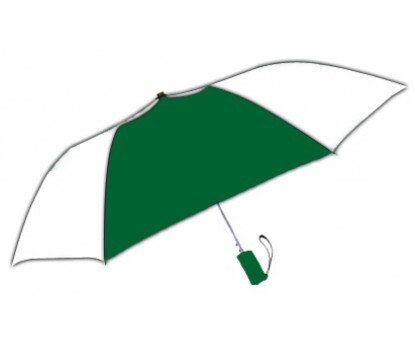 This green thinking umbrella are largely sought by businesses and individuals who wish to send environment friendly messages to others or those who possess this color profile in their brand themes. 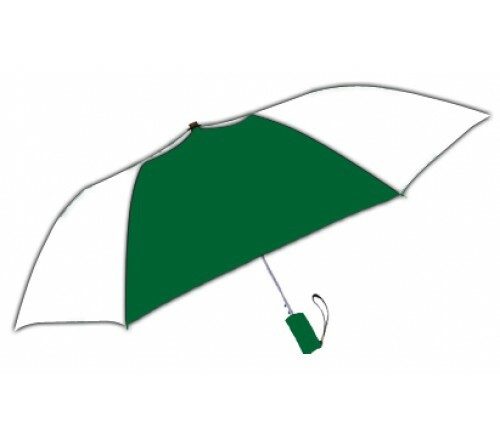 This inspiring automatic open promotional umbrella grabs attention with its 42” arc hunter and white canopy. It simply folds to just 15” and possesses windproof frame construction. It possess round metal shaft, and rubberized matching sure-grip handle. Offered with matching fabric case. Imprint area - 4” x 6”. Available Colors : Royal, Royal/White, Hunter, Hunter/Hunter/White, Black, Black/White, Navy, Navy/White, Red/White, Lime, Pink, Rust, Sky Blue, White and Purple/White.